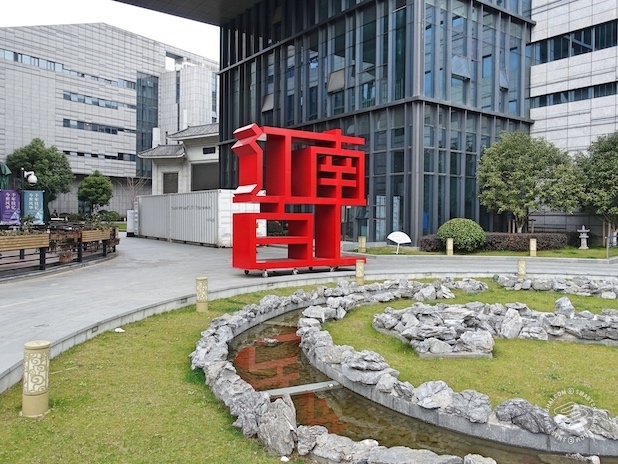 Opened on March 1, this one-month exhibition at Duo Yun Xuan Art Center is not to be overlooked. Since it doesn't have an official title in English, I'll take the liberty of translating its name "江南百工" as "The Hundreds of Artisans of Jiangnan". 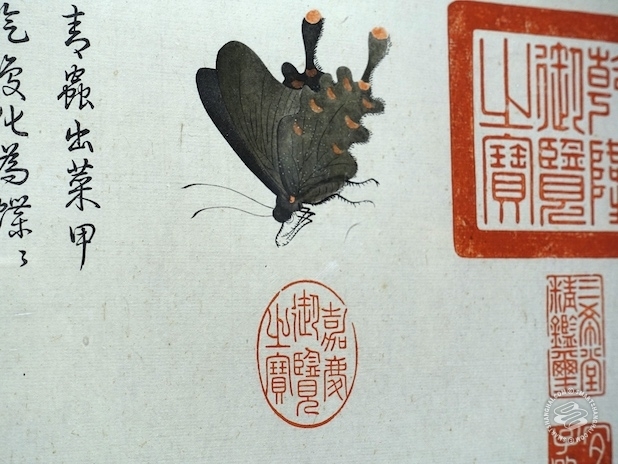 The Hundreds of Artisans of Jiangnan is a government-funded exhibition organized by Shanghai International Culture Association and legacy brand Duo Yun Xuan (朵云轩), which has a century-long history of producing "Four Treasures of the Study" in China (an expression used to denote the brush, ink, paper and ink stone in caligraphy), and is one of the main drivers that pushes traditional Chinese art to younger generations and to the world at large. "Jiangnan" (江南) is a term that generally refers to the area south of Yangtze River, including cities like Shanghai, Zhejiang, and Changzhou, among others. I guess it's safe to say Jiangnan has always been a very affluent part of China. And when you are affluent and wealthy and have plenty of time on your hands, you tend to make a lot of really fancy and time-consuming stuff. The "hundreds of artisans" (百工, baigong) played a significant role in that. In early Chinese history, baigong were specialized artisans living in a hereditary kind of half-slavery. Controlled by local authorities, they didn't have rights to sell the products they made, although the skills they practiced were (and are) regarded as a vital part of China's intangible cultural heritage. At "The Hundreds of Artisans of Jiangnan" exhibition, China's "intangible cultural heritage" is the main focus, and the show focuses on younger artists using these practices to create contemporary arts, along with a range of really high-quality antiques contributed by renowned brands and collectors. The spacious, five-story Duo Yun Xuan Art Center has a lot to offer. Most of the contemporary and Instagram-friendly stuff is on the first and second floors. 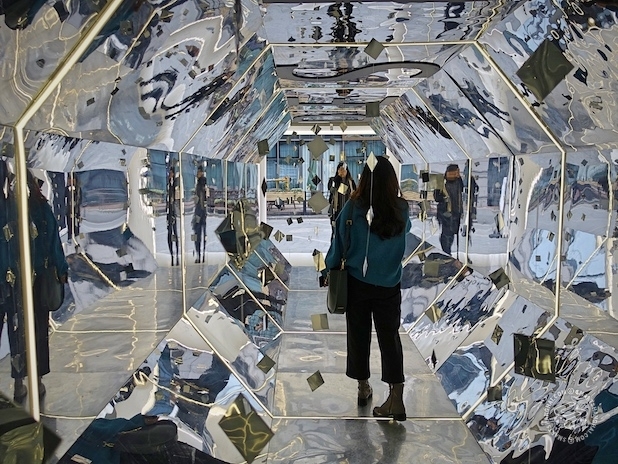 Combining ancient techniques, the pieces are mainly by the Chinese-American installation artist Juju Wang and others. 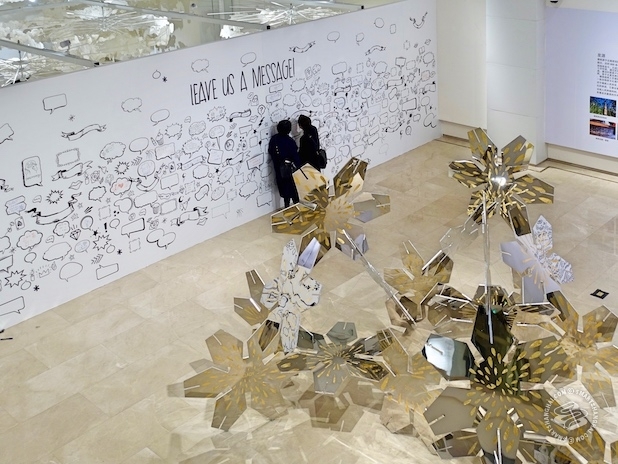 Check out these "snowflakes", decorated with gold foil, which are adopting a Nanjing-originating gold foil technique that dates back 1,700 years. Likewise combining old and new tecniques, the swinging "clouds" are handmade ancient papers crafted by Dai people living in Manzhaocun village, Xishuangbanna, and then engraved using lasers. 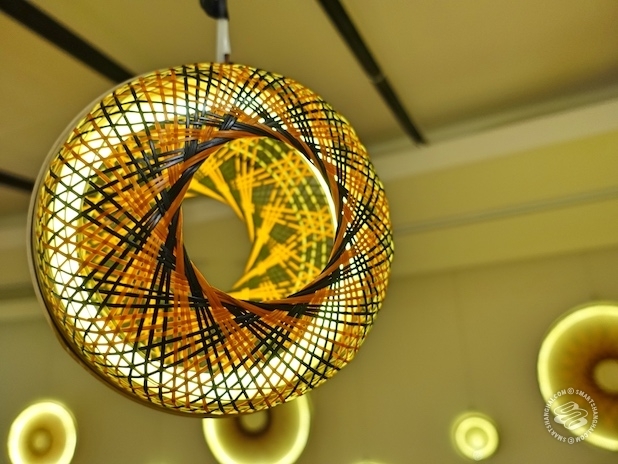 Patterns on these lamps are made with a bamboo weaving technique from Dongyang, Zhejiang. These two containers outside of the building are also from Juju Wang and, unapologetically, ask you to take out your phone and take selfies. I'm not saying these are bad. But the third floor is the real deal. 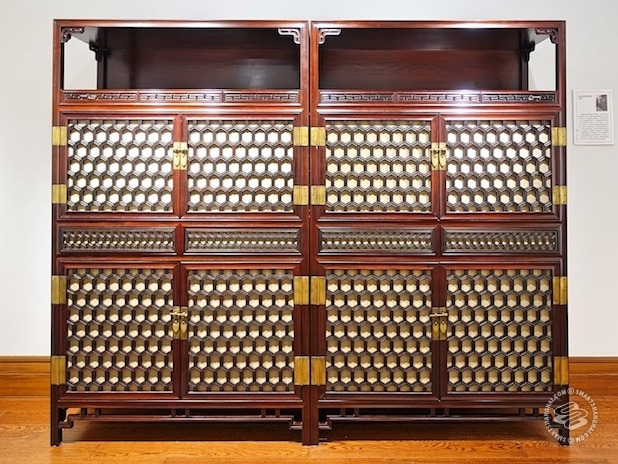 On the upper level are some of the biggest players in the antique industry, including classic Chinese furniture retailers and producers Wu Bao Xuan (吴宝轩) and Pusu (璞素); famous Chinese specialties like Longquan celadon (龙泉青瓷), Jingdezhen porcelain (景德镇瓷器), Yixing wares (宜兴紫砂) and Jinsi nanmu (金丝楠木, a type of rare Phoebe zhennan also known as "golden-silk wood"). 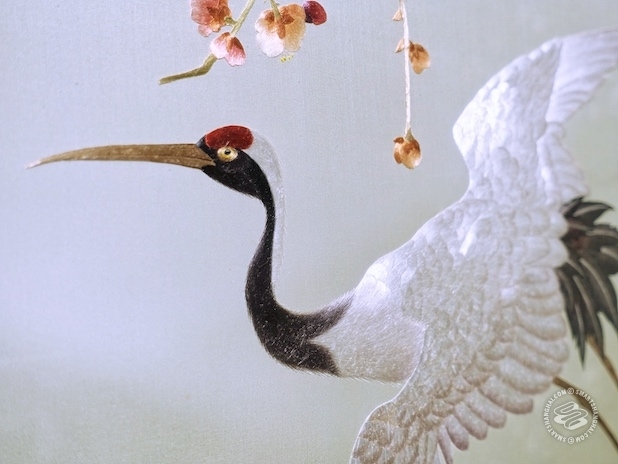 The items on display here are the handworks of younger and senior Chinese artisans, a few of them no longer with us. The unbelievable level of craftsmanship leaves one in awe. 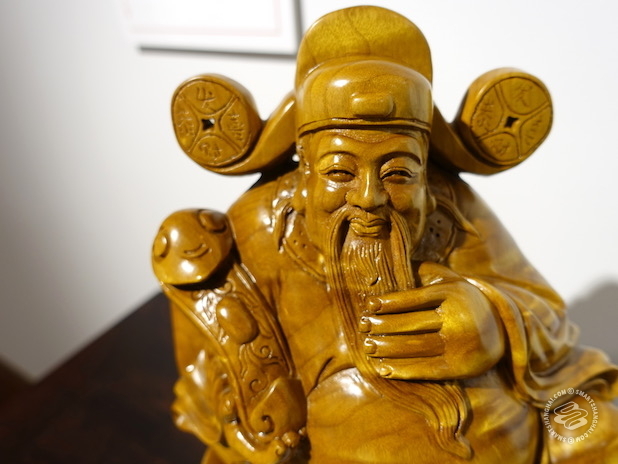 The "God of Wealth" carved out of the "wood of wealth". This well-ventilated rosewood turtleback cabinet is entirely handmade. It has a funny nickname "气死猫" ("piss cats off") -- it's impossible for cats to climb. Unfortunately, all the descriptions on the third floor are in Chinese only, and to appreciate the artistry, for the layman it helps to have done the research beforehand. I was lucky to meet a very helpful young attendant, a tanned chubby guy with long thick hair wearing a pair of traditional cloth shoes. He was incredibly knowledgeable about every item on display. 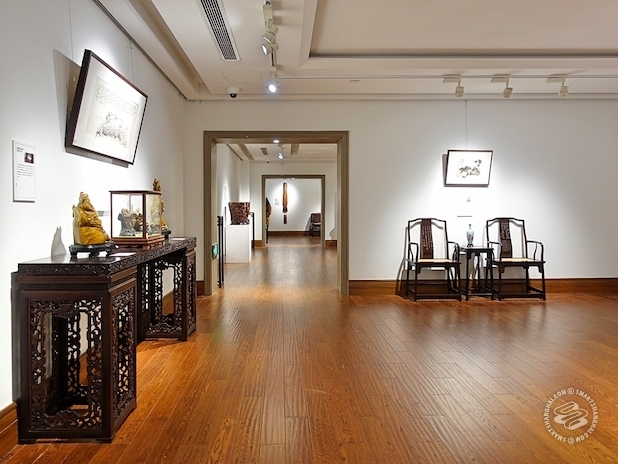 He told me a lot of these items here -- like the Chinese folding screen that features embroidered red-crowned cranes; the brush and scroll painting vase made of thousand-year-old lobular red sandalwood; and the rare replica of an ancient guqing, can all be regarded as "museum-level" showpieces. Classic imperial throne in Qing Dynasty, with reliefs that symbolize longevity and power on both sides. 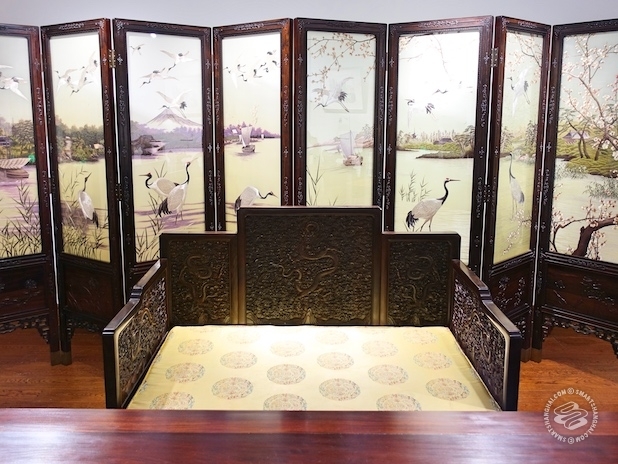 Three years and six months -- that's the amount of time a group of Suzhou embroidery inheritors took to finish this piece. Quite a few pieces here belong to private collectors and hold great value -- too precious to make an assessment of how much they worth. Look for him if you need some help learning the history of these gems. Or definitely use the word lens on your Google Translate app (which can be accessed without VPN, btw) and read those descriptions. Full of enlightenment, I guarantee. A drawing or a rubbing? 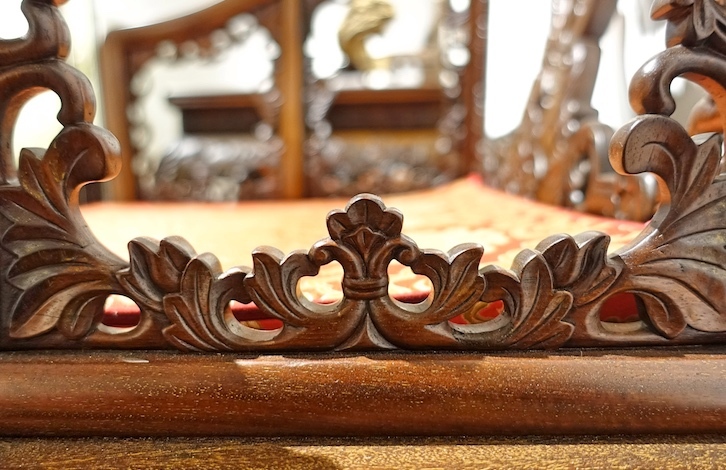 A compact exhibition like this also offer another advantage: just in taking a short stroll, visitors are able to see the transformation of artisan styles within certain historical periods. Walk from one room to another, you'll see the lords of Ming Dynasty were fond of light color wood with minimal design, while during Qing they were more into showy furniture. It also shows the works from younger and older generation side by side, forming an interesting dialog of aesthetics perspective and works ethics. The exhibition ends on March 31, from 10am to 6pm (box office closes at 5:50pm). The ticket prices are 68rmb on weekdays and 88rmb for weekends, 48rmb for student / senior citizens, and they only accept cashless payments. Duo Yun Xuan Art Center has five floors. The exhibition takes place on 1-3F, the fourth floor is a long-term exhibition center for more intangible culture heritage but it closes earlier (4pm), and the fifth floor is Duo Yun Xuan's Dolby Atmos Cinema. Pretty neat. Plan a half-day trip there.